As the human population explodes, we've expanded our habitat into areas that just a few decades ago would have been quite inhospitable. Our desire to put McMansions in the desert and on the sides of mountains often results in disaster, either for the humans living there or the surrounding environment. A future challenge of the green building industry will be to build homes that work in harmony with these harsh climates, while still looking beautiful and feeling comfortable. 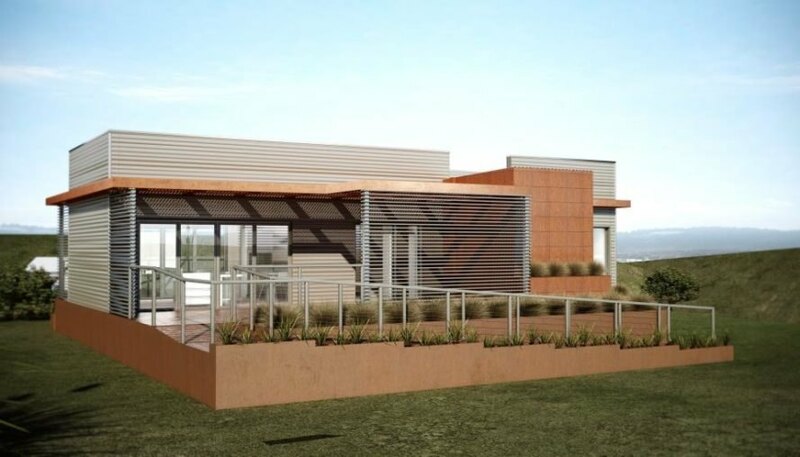 A team of students from The University of Texas at El Paso and El Paso Community College are working on the ADAPT house—an eco-friendly dwelling designed to live up to its name. If you’ve ever visited Texas, you know that for the most part, it’s a hot and dry environment. In and around El Paso, mountains create rocky soil, and hot temperatures often combine with strong winds for a dusty existence. The ADAPT home, created by a collaboration of local college students, is meant to both represent and overcome these challenging characteristics. “The ADAPT home represents El Paso: built at the confluence of two nations and three states; the home creates a bubble of comfort that feels natural on a mountain plateau, high desert, chaparral, or verdant farmland that compose the geography of the area,” write the students. “By harnessing the most abundant resource in the Desert Southwest, ADAPT utilizes forward-thinking technologies to create a net-zero sustainable house that provides flexibility and utility in a new-suburban environment.” Through ADAPT, the team hopes to set a new standard of environmental efficiency, demonstrating that harmonious development is possible, even in El Paso’s unique community and region. The student designers, who broke ground on the ADAPT house in May, infused the indigenous Pueblo’s adaptions to the Chihuahua desert in its design, which is envisioned as a home for the modern native desert dweller. As you might expect, the house utilizes solar panels to harvest the one resource that is readily available in the desert: sunlight. See, although the ADAPT house will be built in El Paso, it will soon be disassembled and trucked to California where the students will participate in the Department of Energy’s 2013 Solar Decathlon. You can follow the team’s progress on their website. If you've ever visited Texas, you know that for the most part, it's a hot and dry environment. In and around El Paso, mountains create rocky soil, and hot temperatures often combine with strong winds for a dusty existence. The ADAPT home created by a collaboration of local college students is meant to both represent and overcome these challenging characteristics. "The ADAPT home represents El Paso: built at the confluence of two nations and three states; the home creates a bubble of comfort that feels natural on a mountain plateau, high desert, chaparral, or verdant farmland that compose the geography of the area," write the students. "By harnessing the most abundant resource in the Desert Southwest, ADAPT utilizes forward-thinking technologies to create a net-zero sustainable house that provides flexibility and utility in a new-suburban environment." Through ADAPT, the team hopes to set a new standard of environmental efficiency, demonstrating that harmonious development is possible, even in El Paso's unique community and region. The student designers, which broke ground on the ADAPT house in May, infused the indigenous Pueblo's adaptions to the Chihuahua desert in its design, which is envisioned as a home for the modern native desert dweller. As you might expect, the house utilizes solar panels to harvest the one resource that is readily available in the desert: sunlight. "There aren’t too many obstacles in building a solar-powered house other than making sure all the equipment is compatible with your system, since nowadays all the equipment is readily available on today’s markets," said Diego Kerstiens, a junior electrical engineering major at UTEP, who is the project’s lead electrical engineer..."The biggest obstacle we face as a team is making sure that the house stays transportable with all these different systems being integrated at the same time." See, although the ADAPT house will be built in El Paso, it will soon be disassembled and trucked to California where the students will participate in the Department of Energy's 2013 Solar Decathlon. You can follow the team's progress on their website.